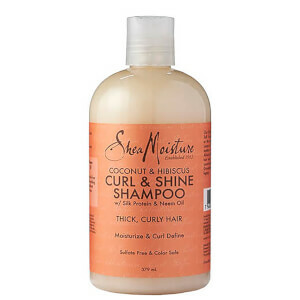 Working to cleanse and nourish thick, curly hair, the Coconut & Hibiscus Curl & Shine Shampoo from Shea Moisture utilises natural and certified organic ingredients gathered from around the world. Enriched with Coconut Oil, Silk Protein and Neem Oil, the luxurious shampoo gently eliminates impurities to leave hair silky smooth, whilst protecting against breakage and fighting frizz. Expect healthy, radiant locks from root to tip. Water, Decyl Glucoside, Sodium Lauroyl Lactylate, Sodium Lauroyl Hydrolyzed Silk, Glycol Stearate, Fragrance (Parfum), Glyceryl Caprylate, Butyrospermum Parkii (Shea) Butter***, Panthenol, Cocos Nucifera (Coconut) Oil, Melia Azadirachta Seed Oil, Aloe Barbadensis Leaf Juice, Tocopherol, Rosmarinus Officinalis Leaf Extract, Guar Hydroxypropyltrimonium Chloride, Stearamide AMP, Glyceryl Undecylenate, Sodium Benzoate, Sodium Phytate, Citric Acid.